Two new Get a Mac adverts have debuted on Apple's website, which sees the dastardly pair of computing miscreants getting up to festive shenanigans. Actually, they are not getting up to much at all, except for building snowmen and putting lights on a Christmas tree. It would all be rather boring if it wasn't for the fact that the pair have been animated! What's strange about the adverts is the fact that they're not really advertising anything, other than the fact that Christmas is around the corner and it doesn't matter if you're a PC or a Mac as, despite the disagreements, everyone should get along. Ah, isn't that nice? Mac does have a sly dig at PC, who decides to write PC Rules in Chrimbo lights (bad PC), and a festive bunny angers PC when he announces that he is going to the Apple Store to pick up some "last-minute bargains". 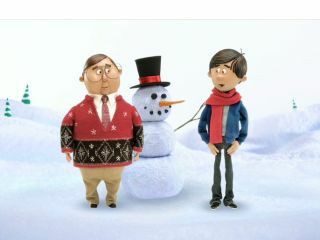 Unfortunately, the Christmas spirit hasn't reached the UK store yet, so to view the ads, you'll have to go to the company's .com address - www.apple.com.